“The days of tears, uncertainty and distress are gone now. Don Bosco Tech has taught me how to build up myself from the scratch” says Aswini with a tone of glee. Aswini, 23 yrs old, comes from the one of the interior villages called Semmiyamangalam in Polur (Tamil Nadu). A family of four members found very hard to meet their daily needs. Most of the time, her father remained at home without any job. It was a crisis in the family with no income from any source. Her mother started to work as an agricultural daily laborer which was also not sufficient for them. Aswini, in her childhood determined to change her family’s situation as she witnessed the hardships of her poor mother. After her schooling, she started to work temporarily in some places. Don Bosco Tech signed an agreement with QUEST Alliance for implementation of Skills to Succeed in Retail Blended Learning Program which helped the youngsters like Aswini to transform their lives. The program focuses on blended learning content in English, Life Skills, Work Readiness and Retails Customer Interaction through the LMS at each of the training centres. 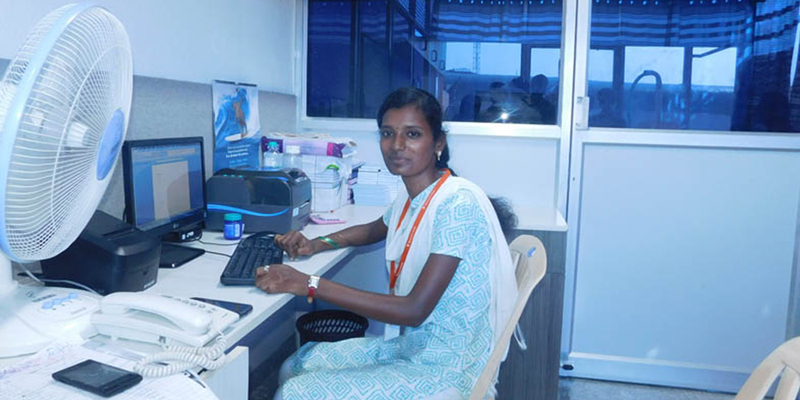 Aswini was placed in Bharatham Stores as a Sales Executive with a salary of Rs.6500. But now she is promoted as Office Administrator. She is drawing Rs.10000 per month which is exclusive of incentive. “My parents and I didn’t expect that I would achieve my dreams in a short period. I am so happy that my mother is relaxed of our financial burdens,” she said. “We have a good number of Don Bosco Tech trainees working in our stores. With them, I have built a strong team, who are quite passionate and organized. Thanks to Don Bosco Tech for finding and molding these deserving rural youth which turns them as the successful individuals in their career,” says Mr. Vignesh, Managing Director, Bharatham Stores, Chennai.